Johnson & Johnson has released a new version of its Donate a Photo app on iOS and Android devices. The charity-based app encourages users to take photos with their mobile devices and share those with United Way (or other charities) within the app. 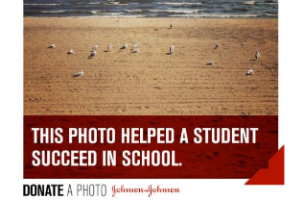 For each picture uploaded, Johnson & Johnson will donate $1 to United Way’s education programs, all in an effort to help students with mentoring, tutoring and other necessities. After downloading Donate a Photo, users can choose to support the United Way (the app’s current promotion), or another charity of their choosing. The app has previously partnered with Children’s Miracle Network Hospitals, Save the Children, the U.S. Soccer Foundation and more. In terms of the United Way campaign, users can upload one picture to the cause each day, every day, until October 14, 2014 or until $50,000 has been raised. Either way, United Way will receive a minimum of $30,000 as part of this promotion. When donating a photo, users can take a new picture within the app or choose an existing image from their camera roll. They’re encouraged to add a description and share the image out to social media to get their friends in on the act of donating as well, but even if they don’t, images are available to view by others within the app. Users can browse charities to see the photos donated to those specific causes, and can also connect with Facebook to view the photos their friends have shared. The Donate a Photo app is available to download for free on iTunes and Google Play.